The sun is up and its already weekend - pay day weekend, actually - and what better way to spend those hard-earned moolah than hitting your most favorite mall in town and get the best deals that you can get! 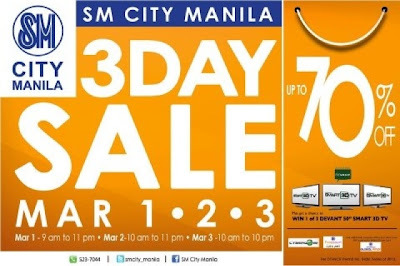 Did you know that SM City Manila has the best offering with their almost 70% off on selected items mall wide? As the summer season hits the town, its about time to update your wardrobe and get those vibrant and comfortable summer clothes at a very affordable price! 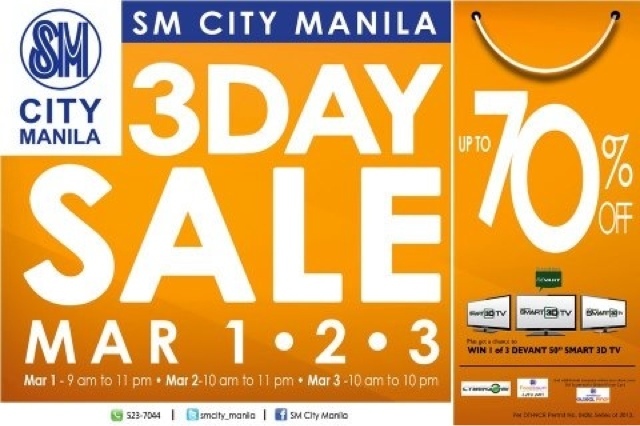 And just like the tradition, started yesterday, Friday, March 1, the 3-day sale of SM City Manila already made some shoppers gaga with the amazing discounts, freebies and promos that they availed on their purchases. I will be there later to continue my latest shopping addiction - new born baby shopping, and I'm just wishing that I have enough money to buy all the cutie stuff that I could find there. 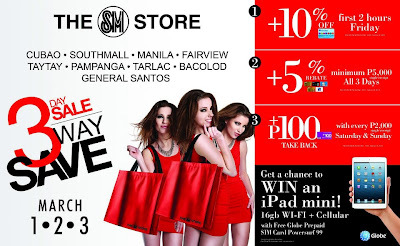 I'm targeting to buy some stuff toys and pillows and comforter for the baby crib that I bought yesterday at The Big Sale of SM Southmall, so I know that this is gonna be an exciting and fluffy day for me! Hope to see you there later! If not, well, this 3-day sale is up until tomorrow, Sunday, March 3!